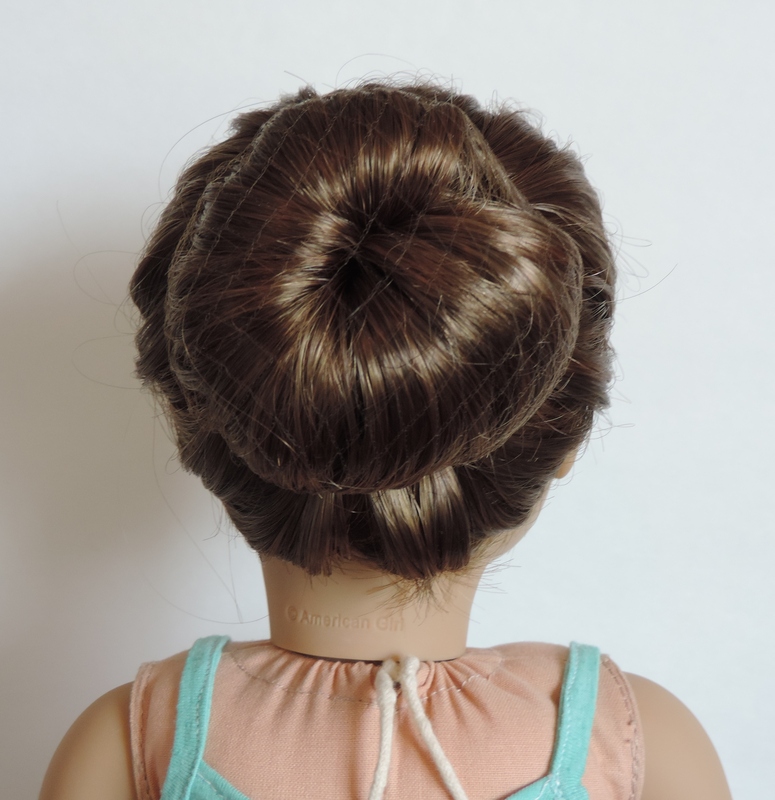 This hairstyle is called the Triple Knot Hairstyle, and I learned how to do it here. 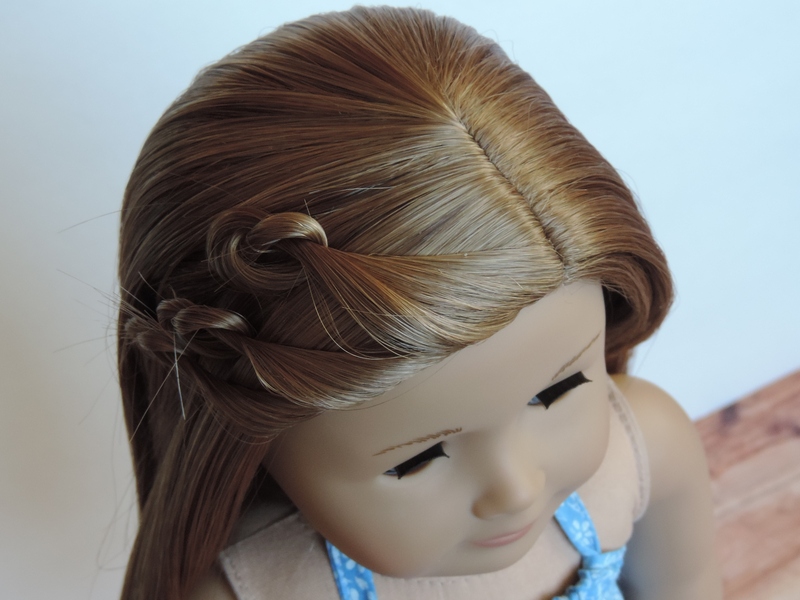 All you will need to do it on your doll is a couple bobby pins. I use the Mini Goody pins. 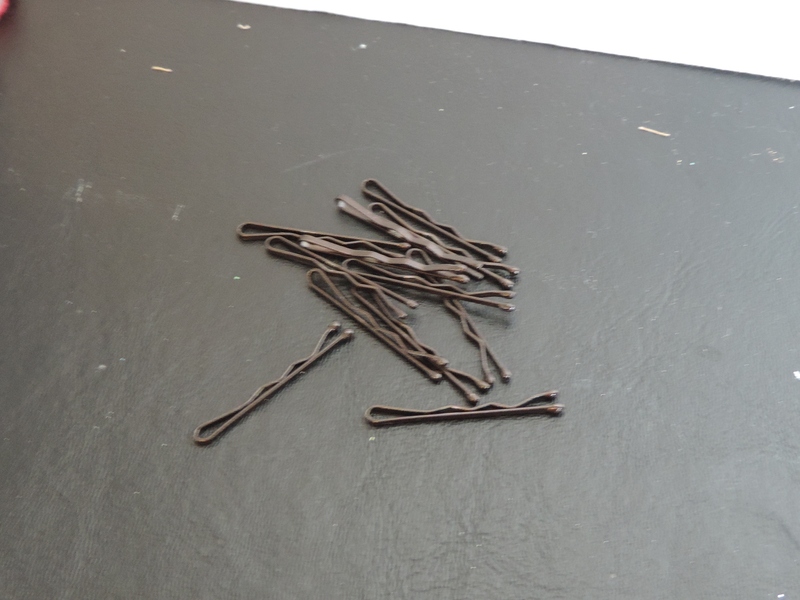 Larger bobby pins may work too, however they will be harder to cover up. 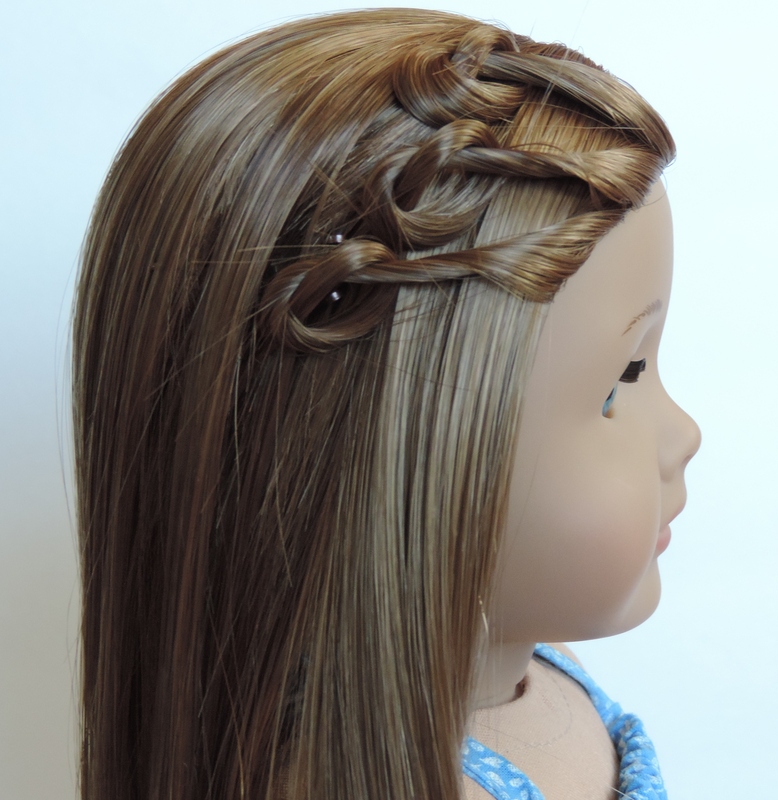 This hairstyle is very easy, fast, and cute for summer! 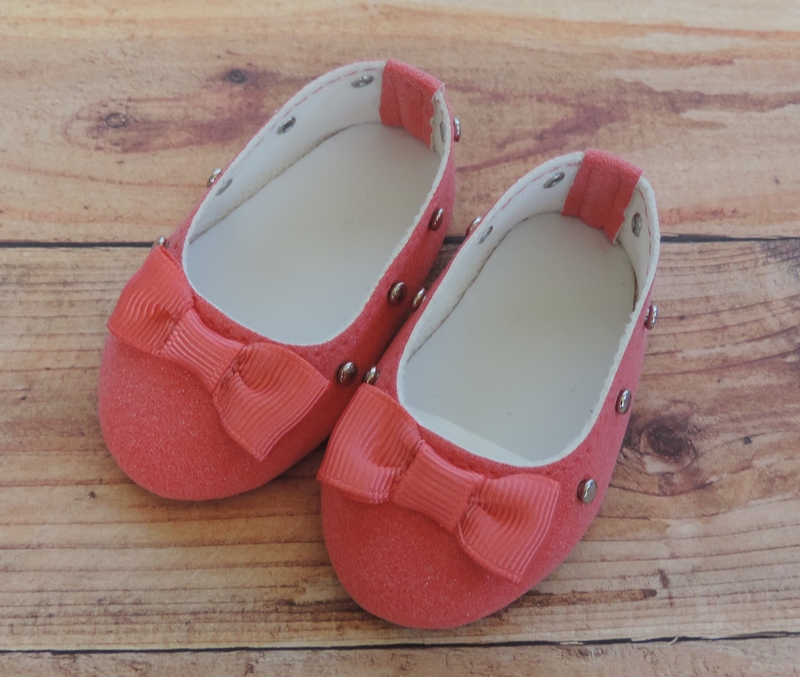 I have decided to write my first review on a pair of shoes I recently got! 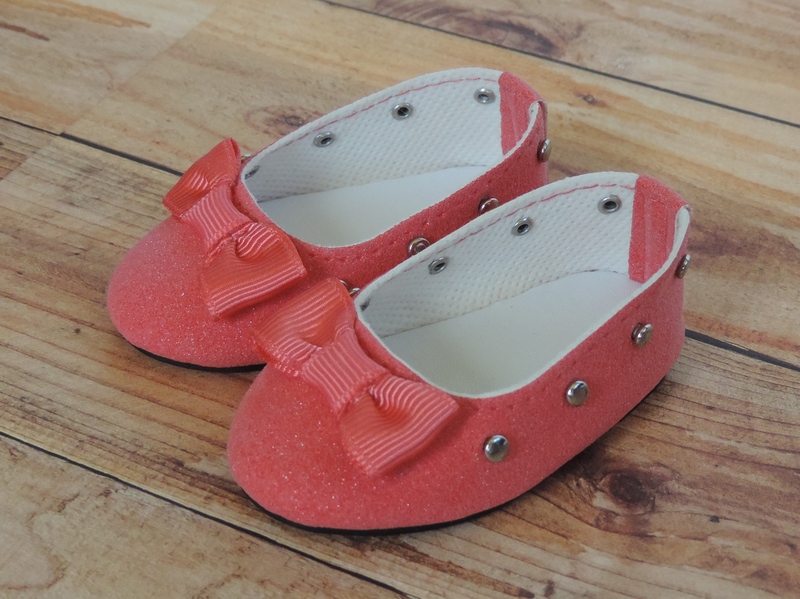 The Our Generation “Red All About It” shoes are a sparkly coral-ish pink. 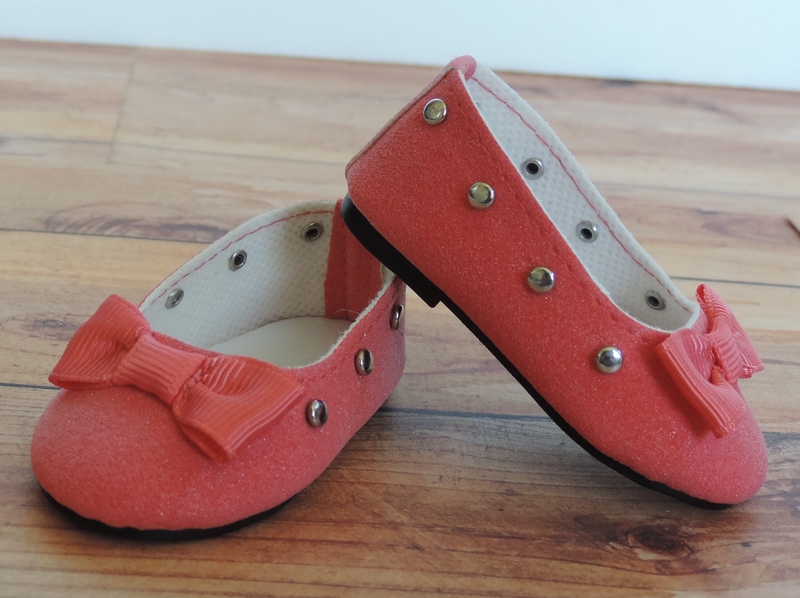 They have a cute ribbon bows on the front, and silver metal studs all the way around. The studs rattle a little when putting on the shoes, but it doesn’t look like they will fall out. I expected the shoes to have a gritty feel to them, because of the glitter. Actually, they are quite soft to the touch. 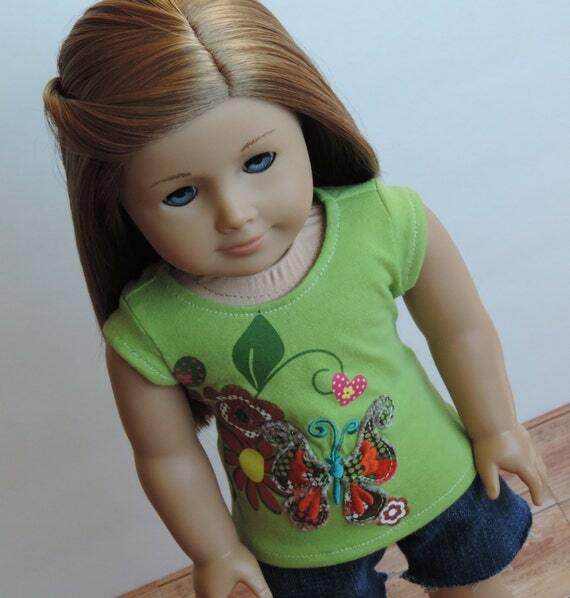 I have heard that some Our Generation Shoes don’t fit American Girl Dolls well. However, these flats fit my AGs very nicely. I especially like these shoes because they are a unique color. 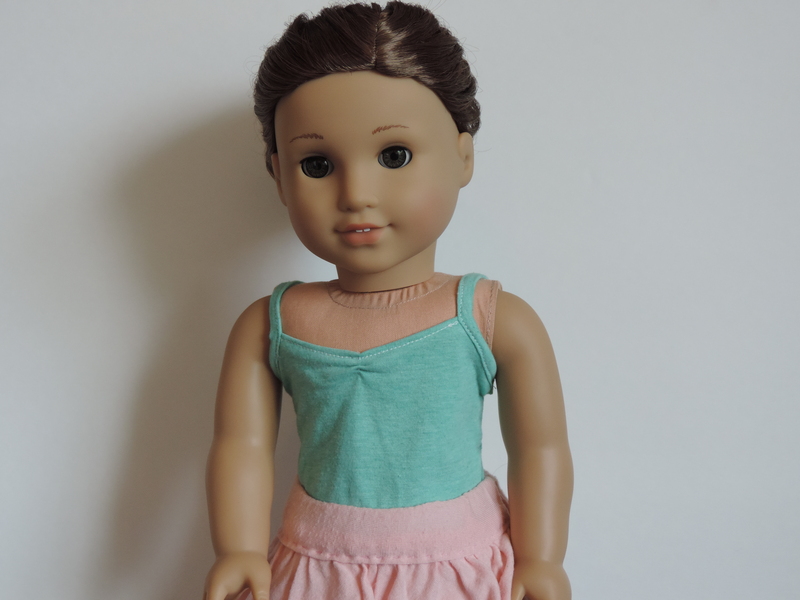 The soles are black plastic, similar in material to the soles of the purple shoes in this outfit which are from Sophia’s on Amazon. 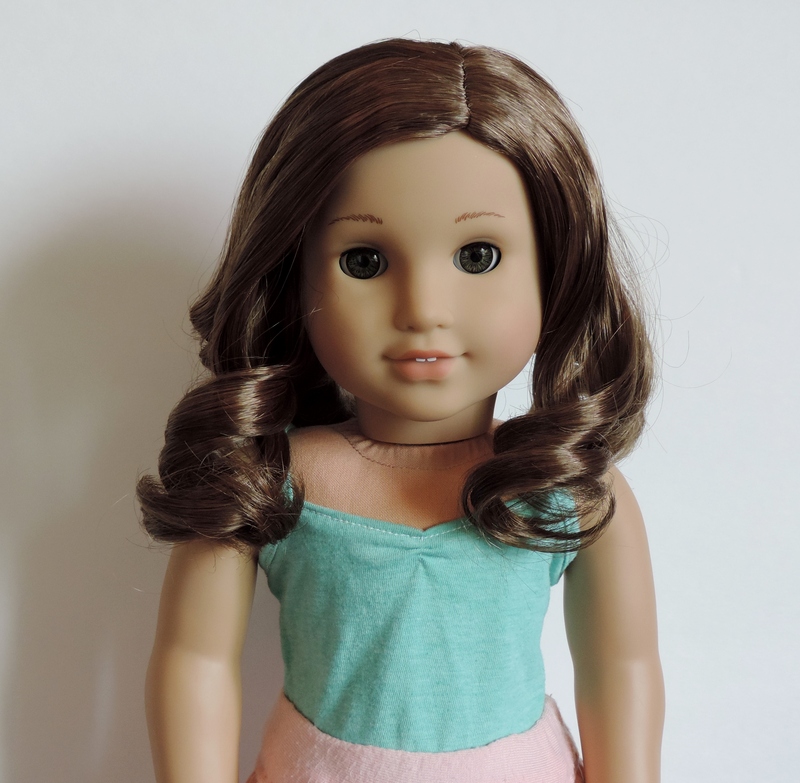 I’m excited to show you what my dolls are wearing today! 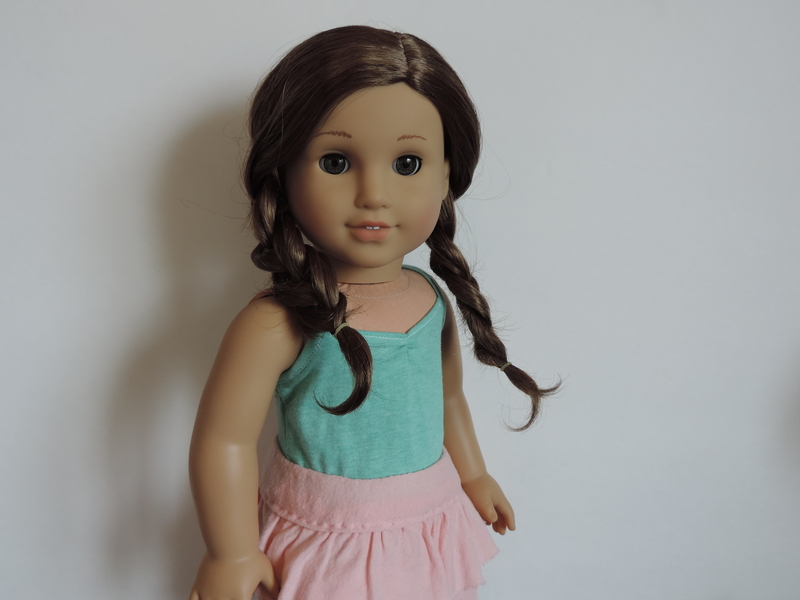 My Rebecca doll is wearing lovely outfit with many different colors, and my other AG doll is wearing a Frozen inspired outfit. All items, except the shoes, are made by me. You can see how I made the shirt here, and how I made the shorts here. 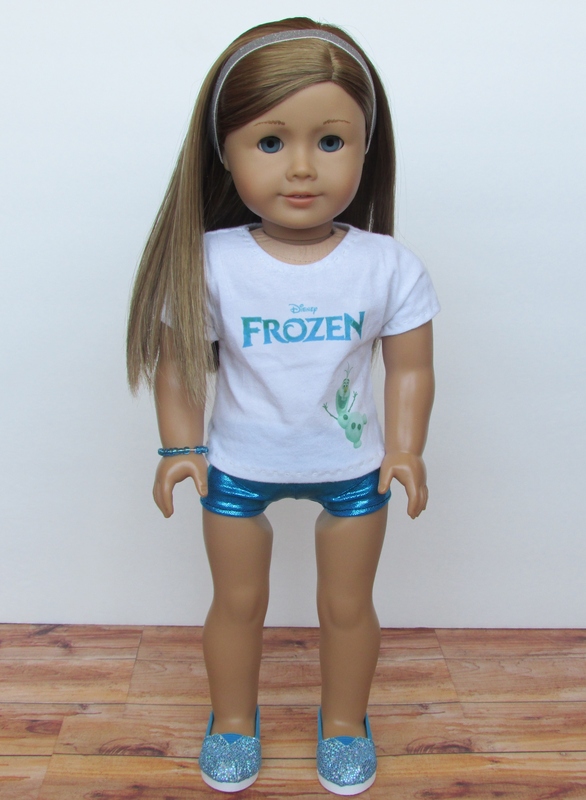 Sparkly headband (see here) and shoes (from American Fashion World on Amazon.com) contribute to the “frozen” theme. 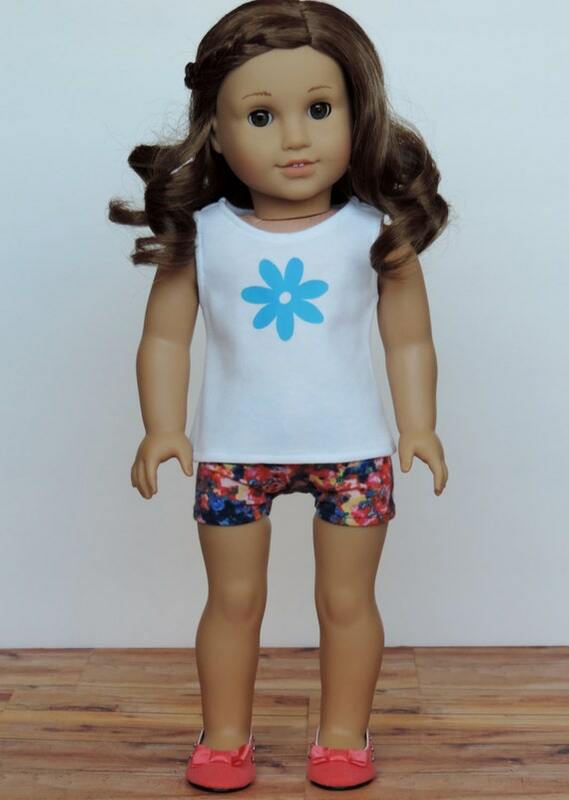 For this outfit, the post featuring the t-shirt is here (since the post I have added a rhinestone flower to the front), and the leggings here. 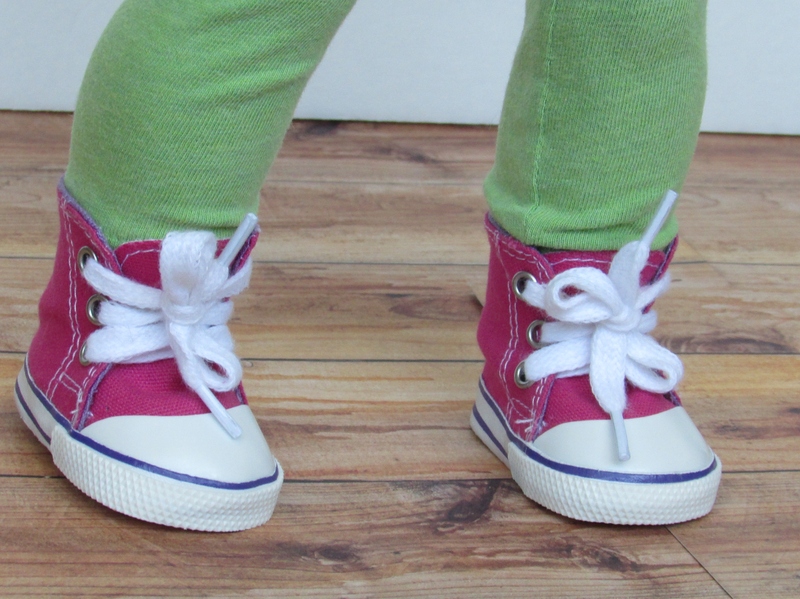 The hot pink high tops are from Sophia’s. 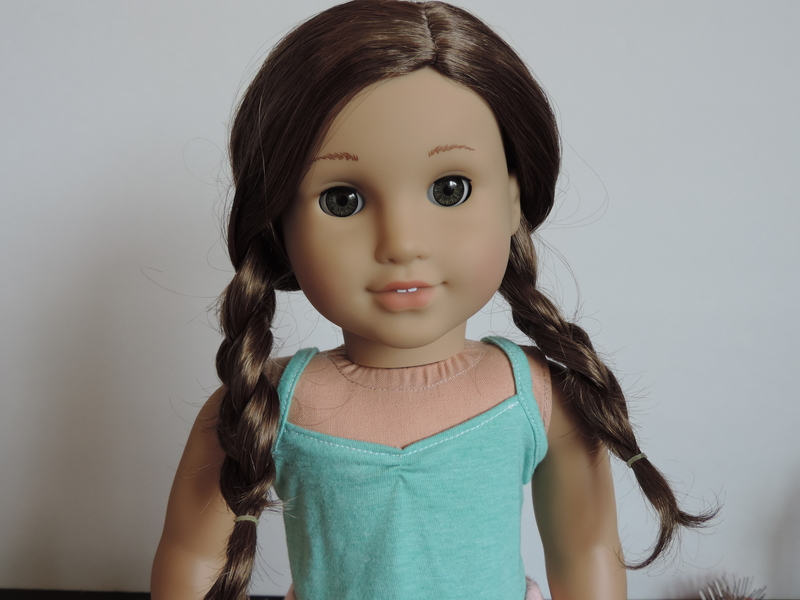 Also, it’s Freebie Friday today over at PixieFaire.com! 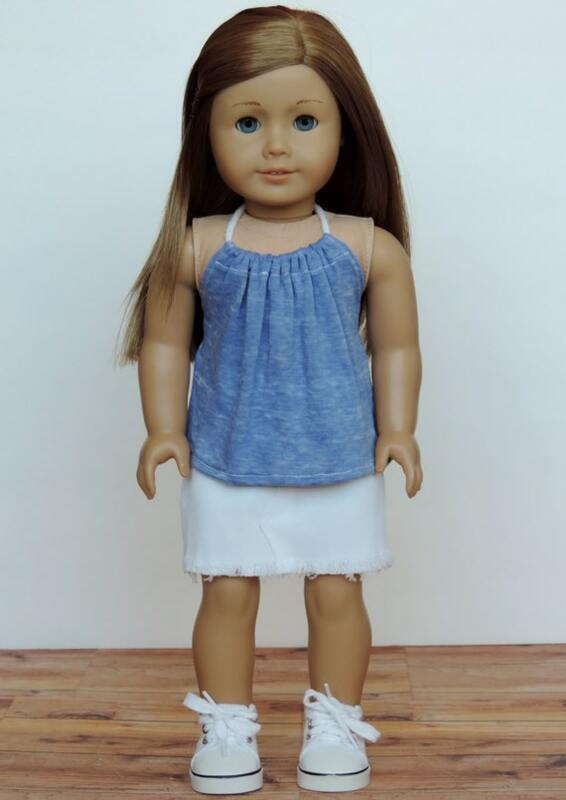 The free pattern for today is the Gladiator Sandals for 18 inch dolls. You can hop on over and download it by clicking here! 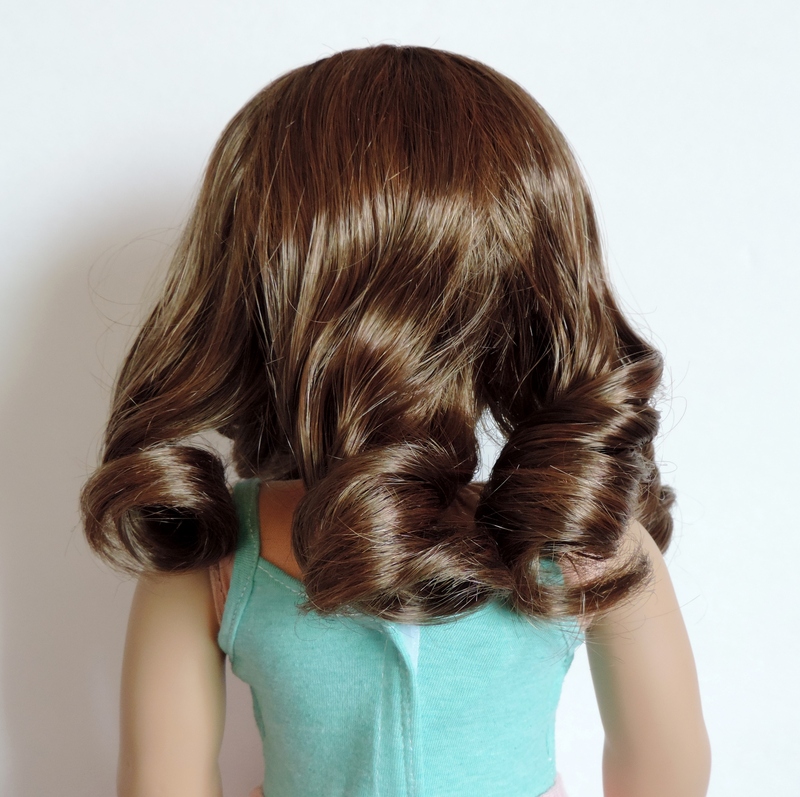 Today I will show you how I fix my Rebecca doll’s curls if they get messy. 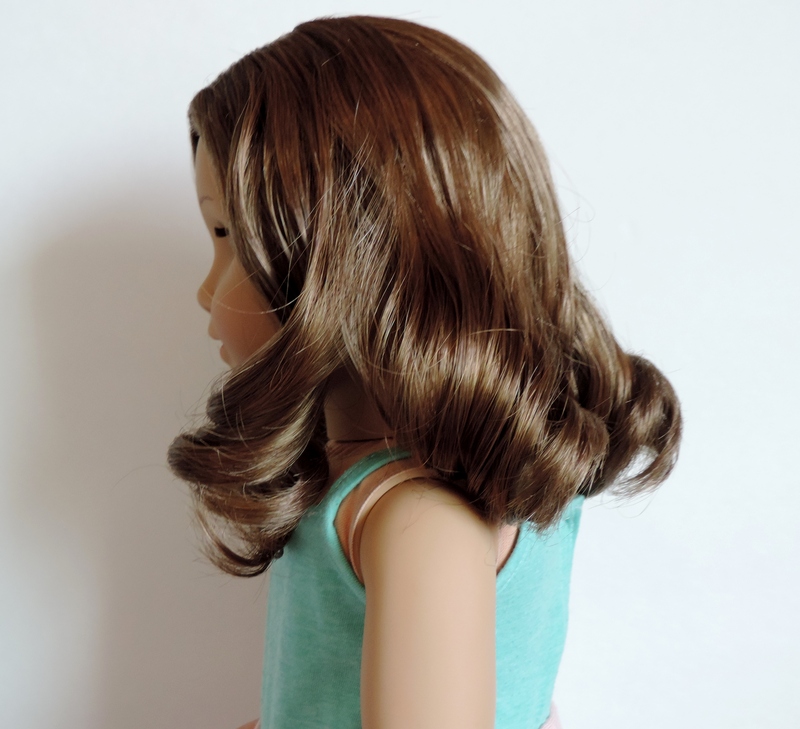 I first learned how to redo her curls from this post on AmericanGirlFan. 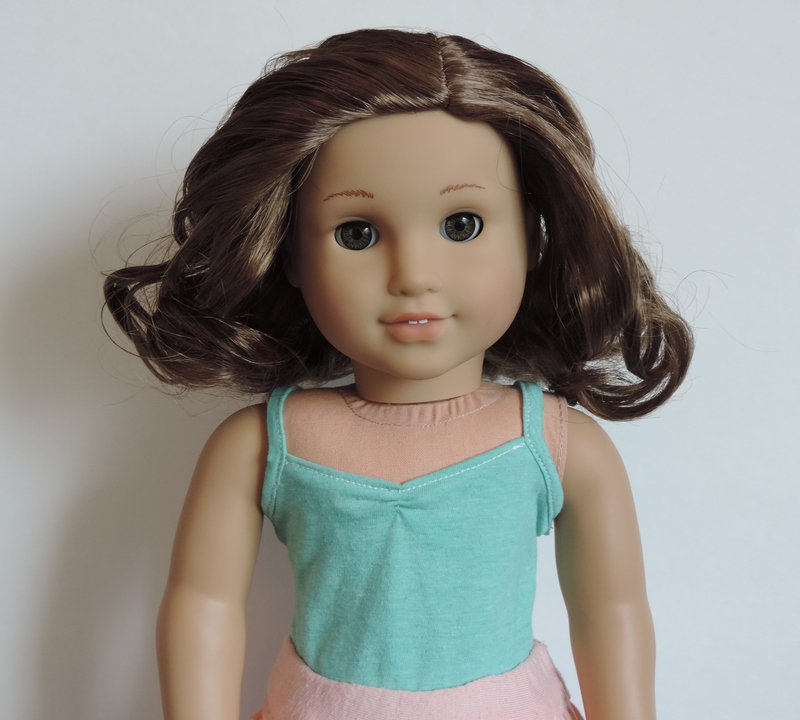 You will need a doll hairbrush and a spray bottle. 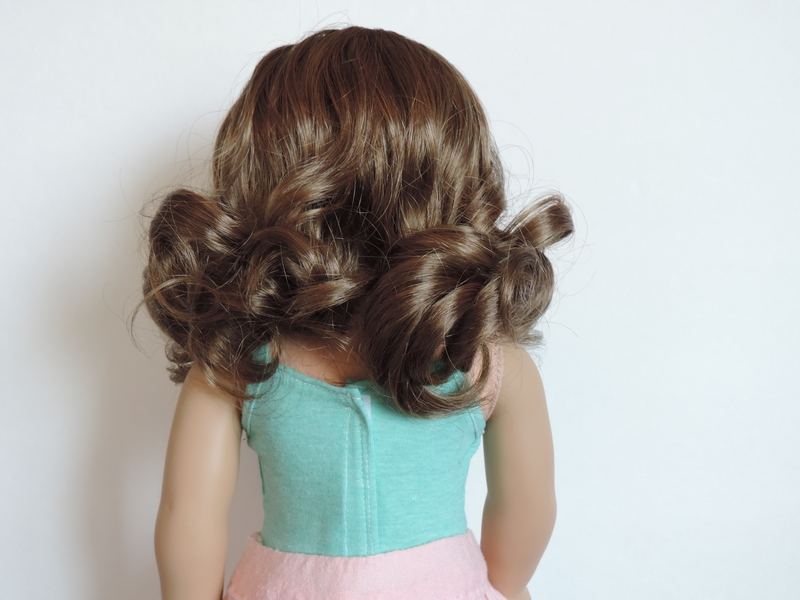 Find the base of each individual curl, and separate it from the rest of the hair. 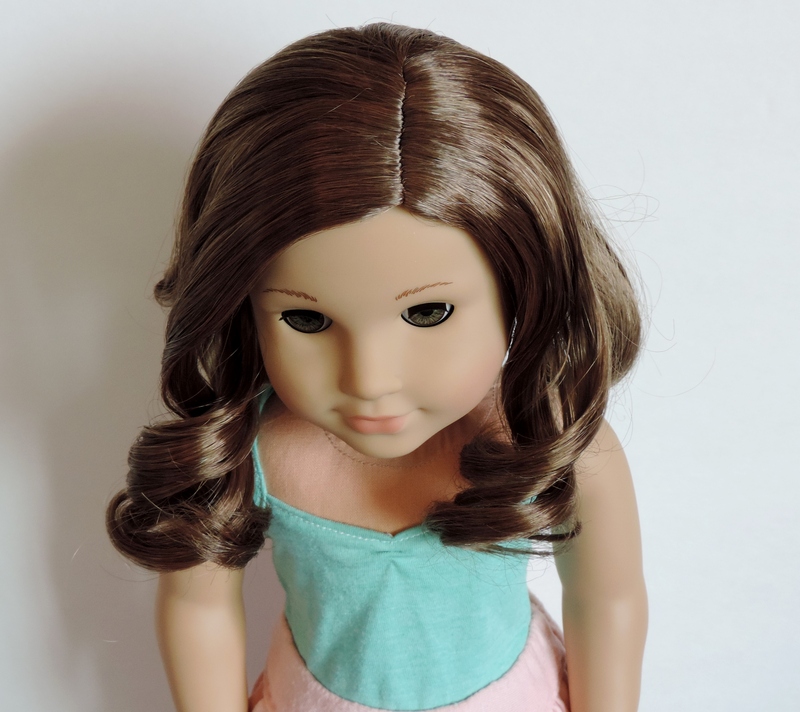 Spray it lightly with water, being sure not to let the water get near your dolls eyes. Let the twist loosen up. 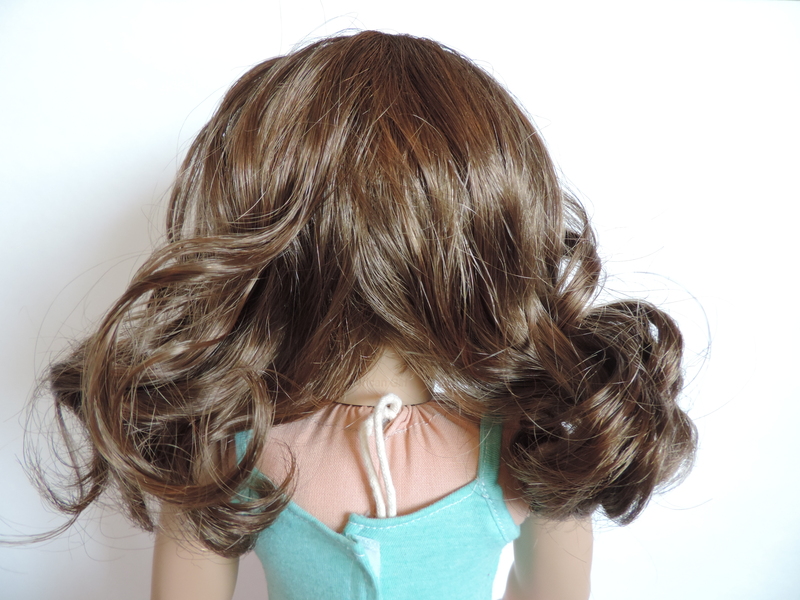 If the curl doesn’t look right, you can redo it or arrange it. 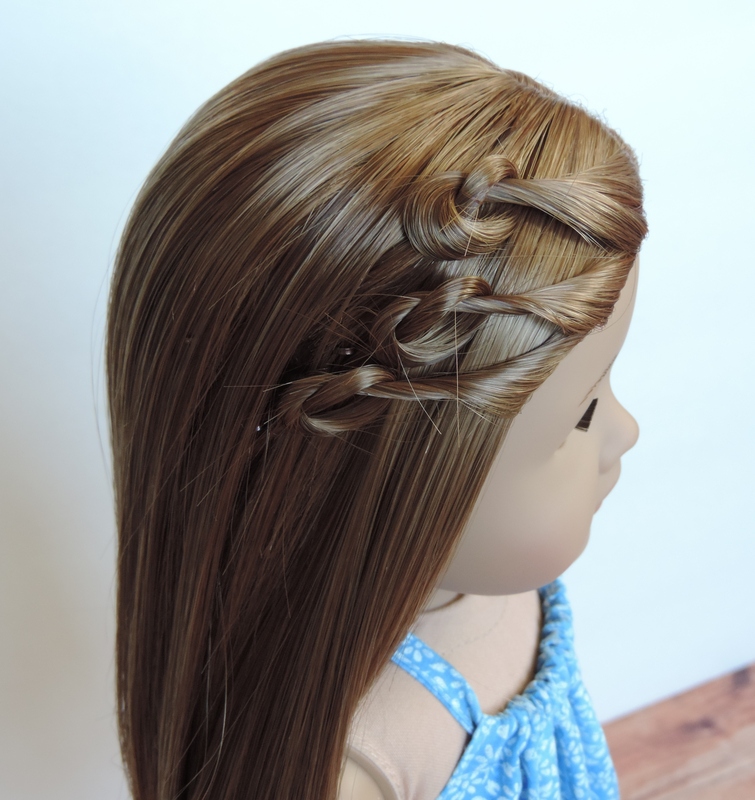 Do this all around your doll’s head. It will take time, but at the end it will look so cute! 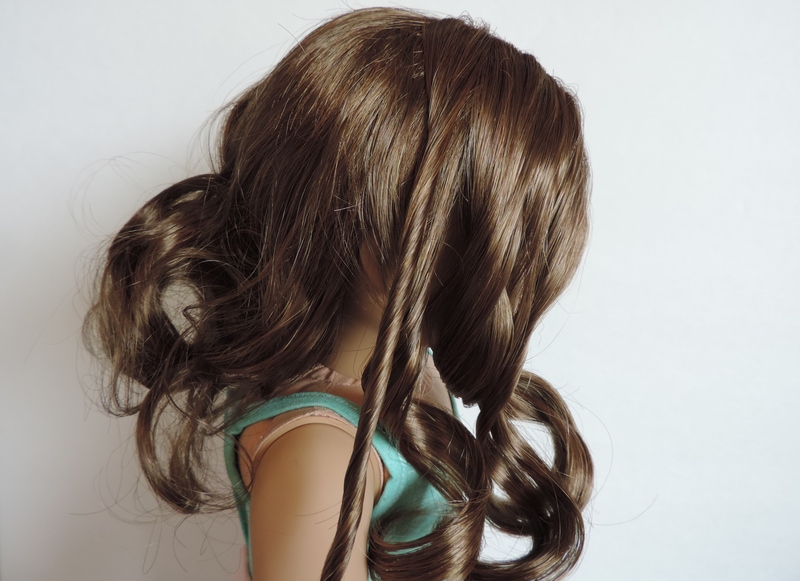 I usually do curls like above, but you can also make larger curls by taking more hair in one curl and twisting it. 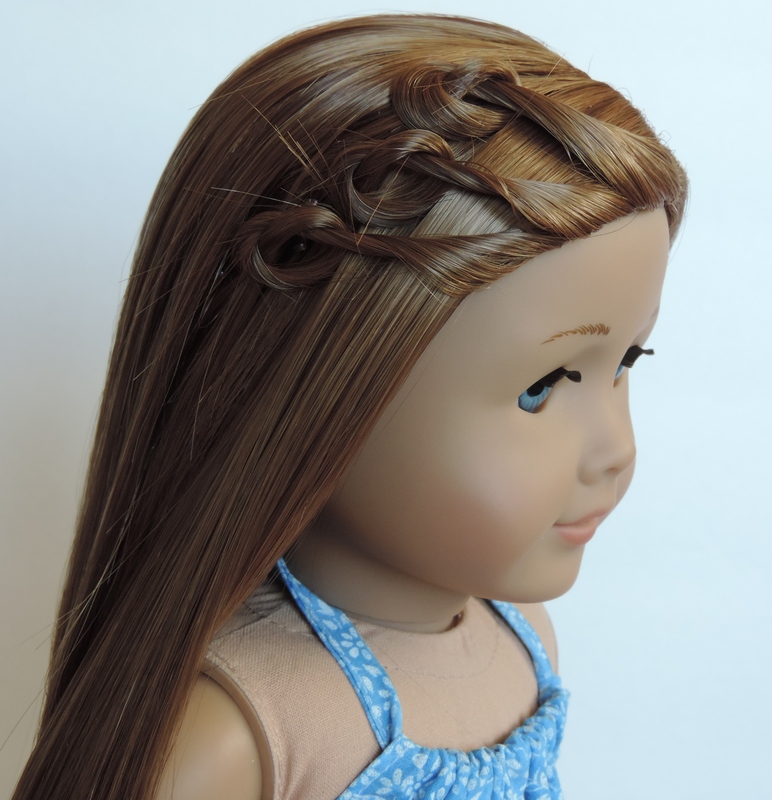 Two low braids are so cute for a casual summer day! 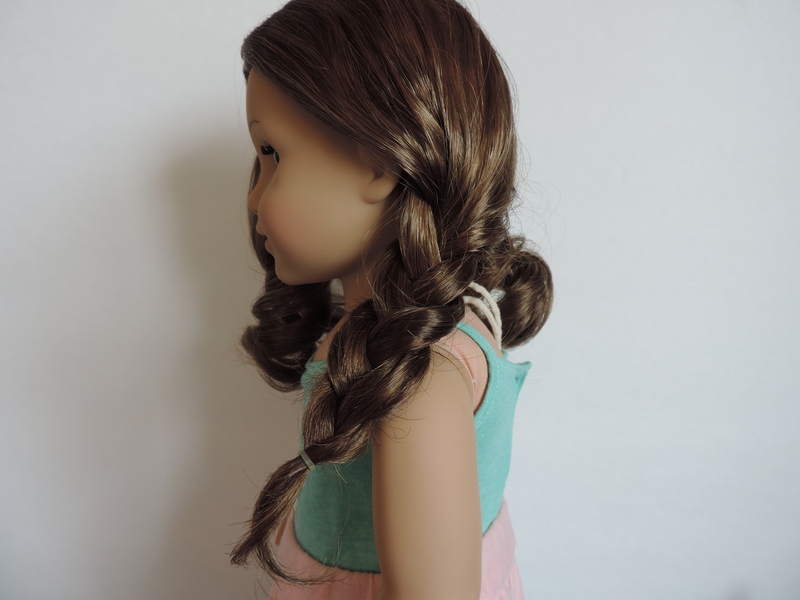 You will need a doll hairbrush, two hair ties, and a spray bottle. Let’s get started! 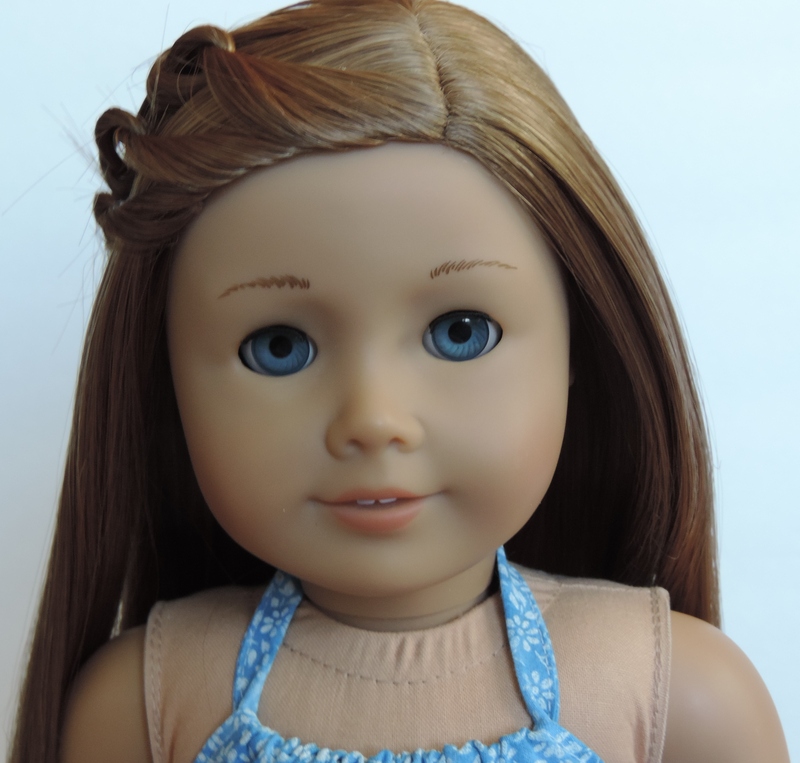 Begin with your doll’s hair down. Spray it with water so it is very slightly damp. Separate it into two equal sections. 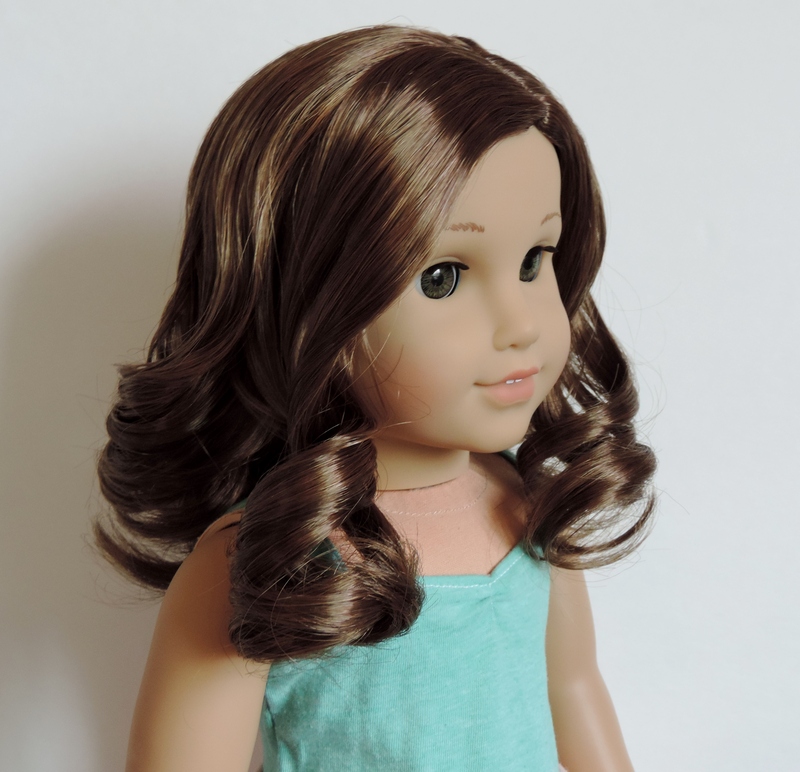 I didn’t need to brush out all my doll’s curls. Braid the two sections, positioning the braid so it begins just behind the ear. 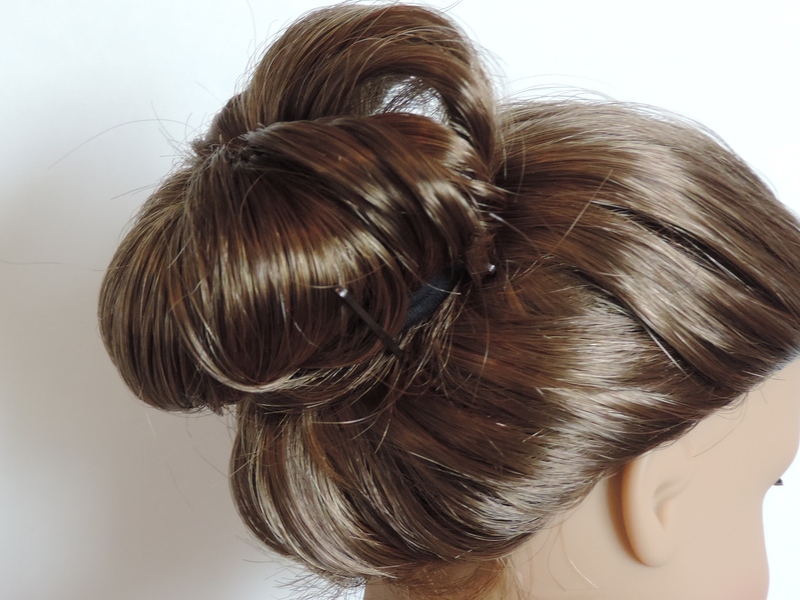 Finish with a small hair tie on each side. 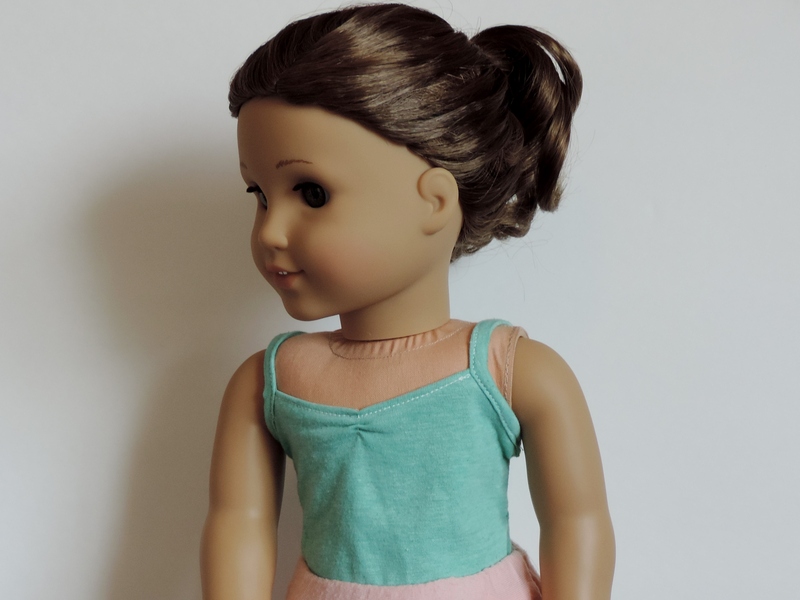 Recently I picked up a cute girl’s swimsuit to upcycled into a doll swimsuit. 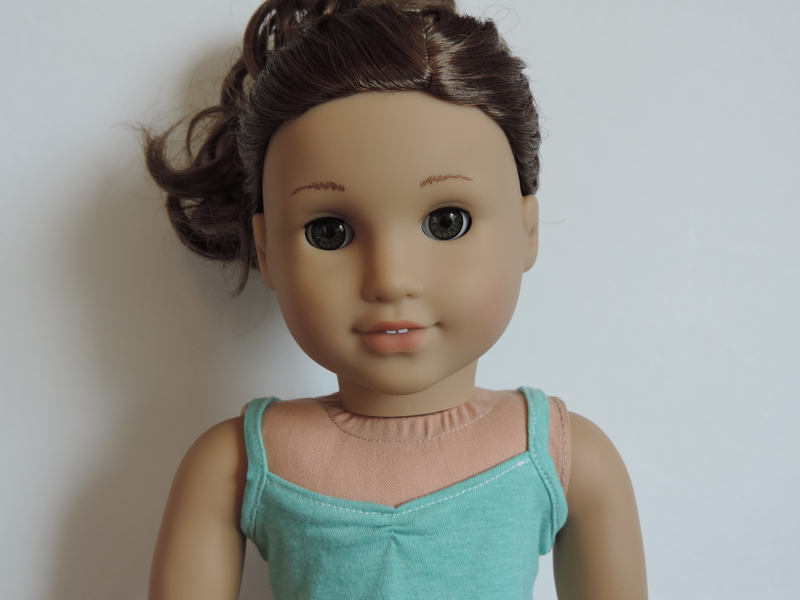 It was my first time making a swimsuit using my sewing machine, so my dolls get to keep this one! The swim fabric has pairs of flip flops on it in many different colors. I used the free swimsuit pattern on Pixie Faire here. I didn’t fold the fabric twice over, just used the lining that was already in the girl’s swimsuit. I used white fold over elastic to finish the edges. The blue shorts I upcycled from a girl’s rashgaurd. I used this pattern on Pixie Faire. These shorts are super quick and you don’t even need elastic! 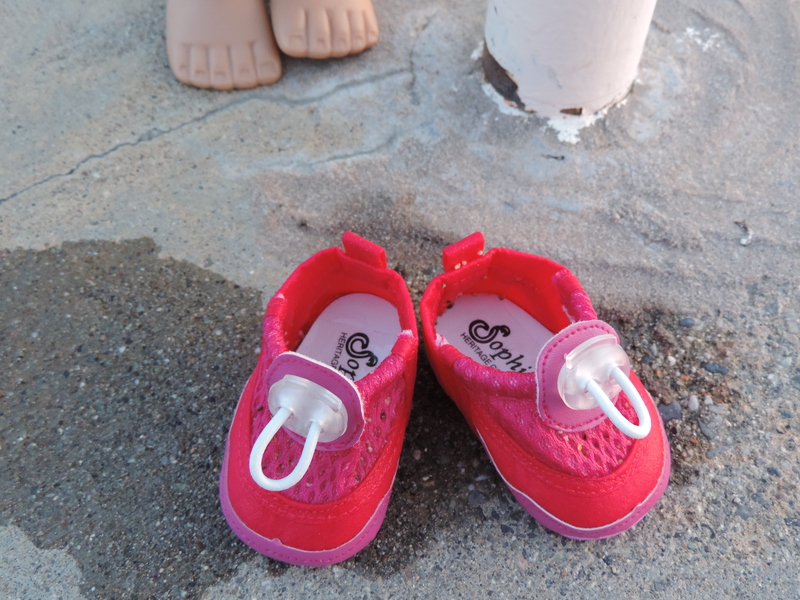 I got the pink little water shoes from Sophia’s. You can see them here. I did realize they have cardboard insoles which came unglued when they got wet. I will probably cut new insoles from craft foam and put them in the shoe instead. You can read how I made the flower hair clip here. 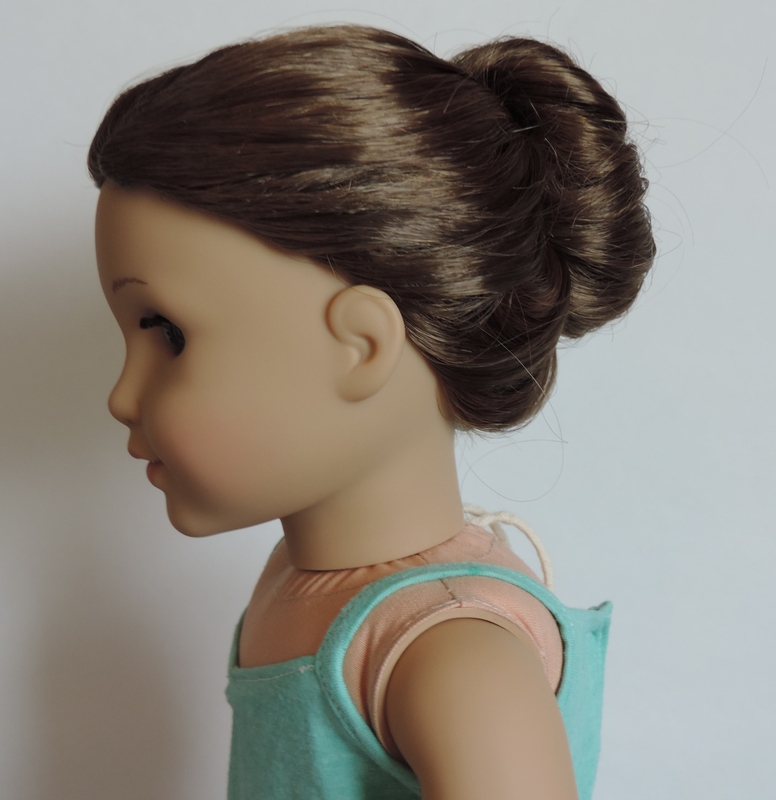 To do this bun, you will need a doll hairbrush, a spray bottle, two hair ties, mini bobby pins and a hair net (optional). 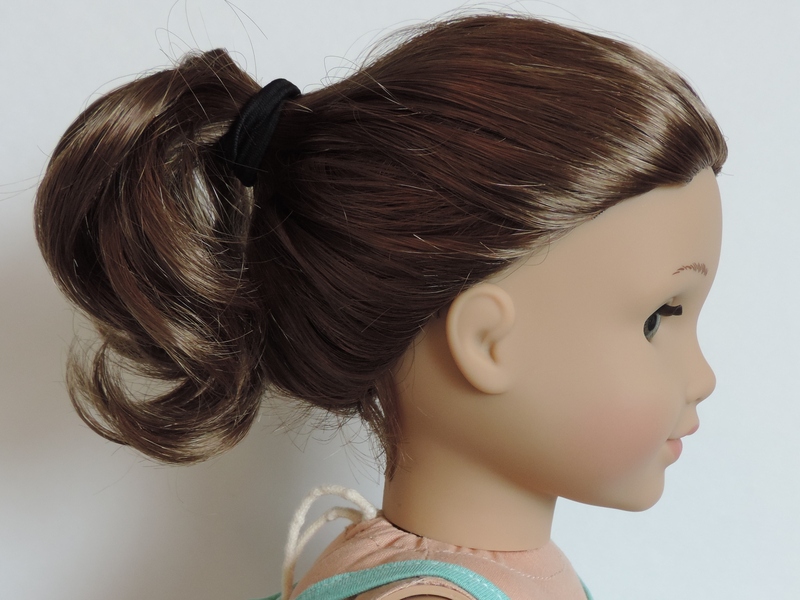 Start by making a ponytail. 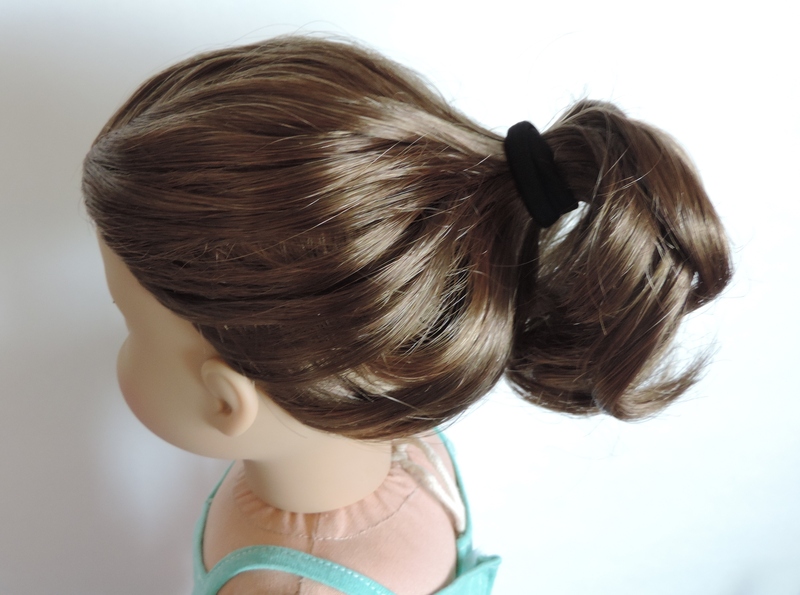 See here for my previous post on a ponytail. 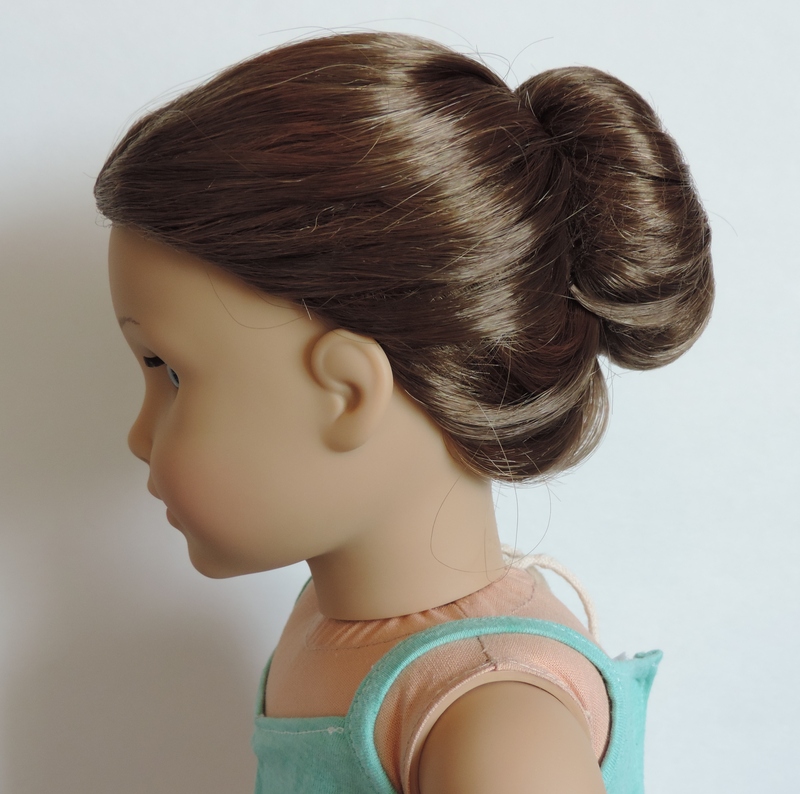 Gently bring the hair around the base of the pony, making this shape. I then slipped a hair tie over for extra security. Arrange the hair if you need to. 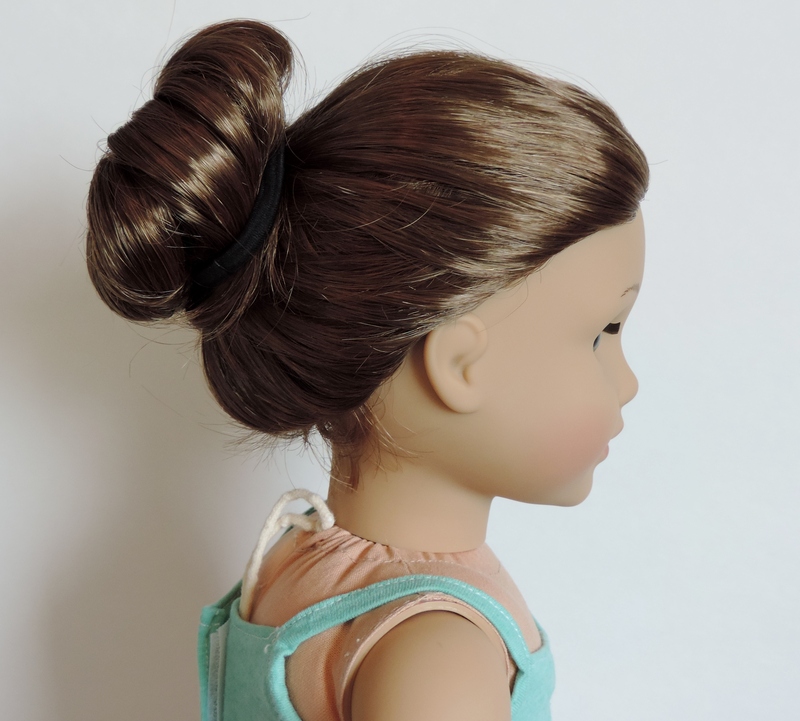 Now you will need to use bobby pins to pin the bun in place. I used Mini Goody pins. 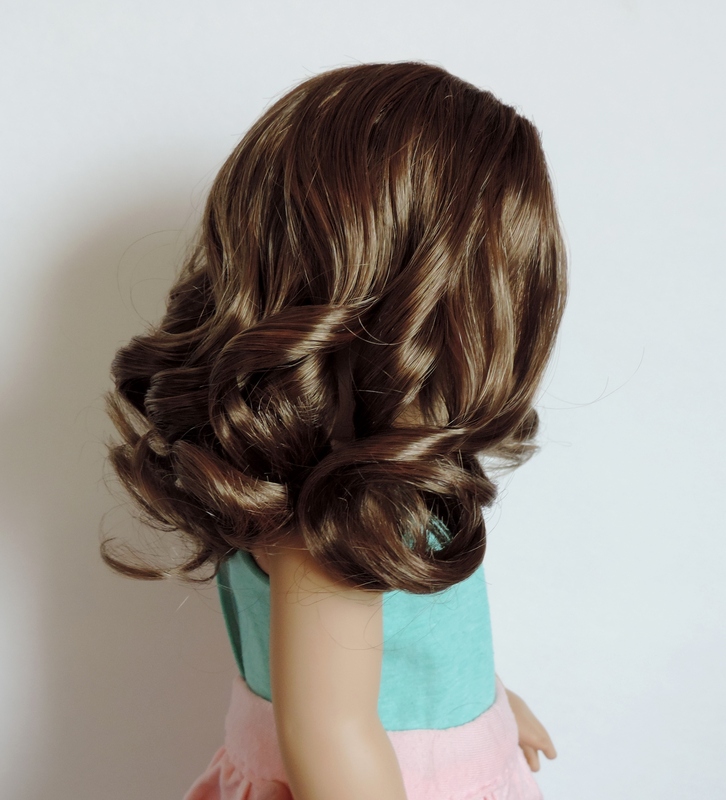 They are the perfect size for dolls! 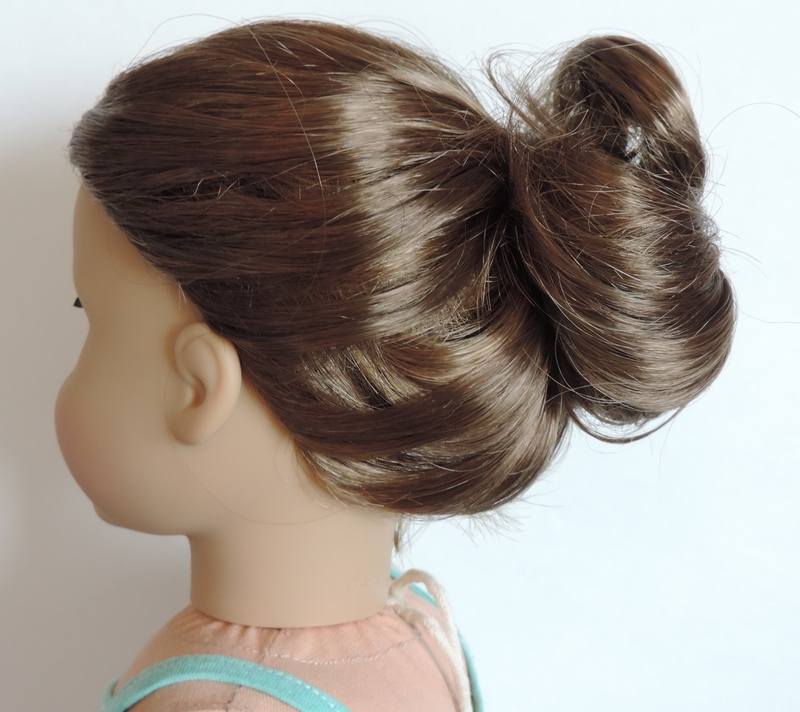 Take a pin, and stick it into the edge of the bun, straight towards your doll’s head. 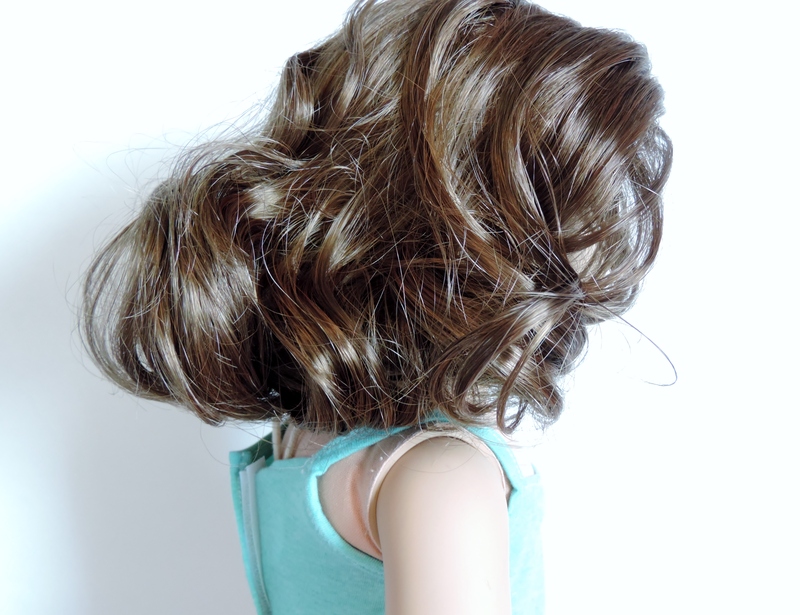 While pushing it down and in, make sure to get it into the hair that is on the head. Don’t push the pin into the wig, just the hair. 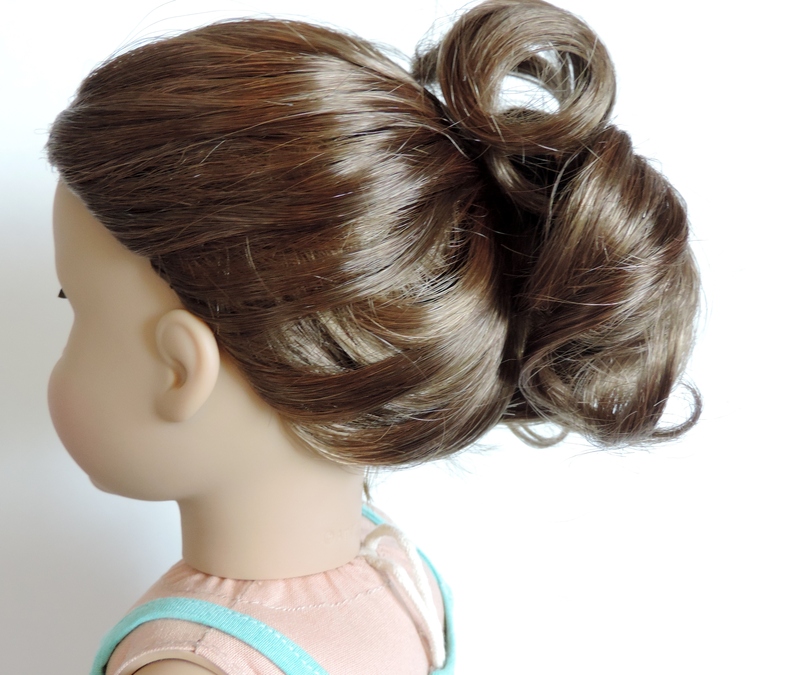 One you’ve attached the pin to the bun and the hair on the head, push it in. 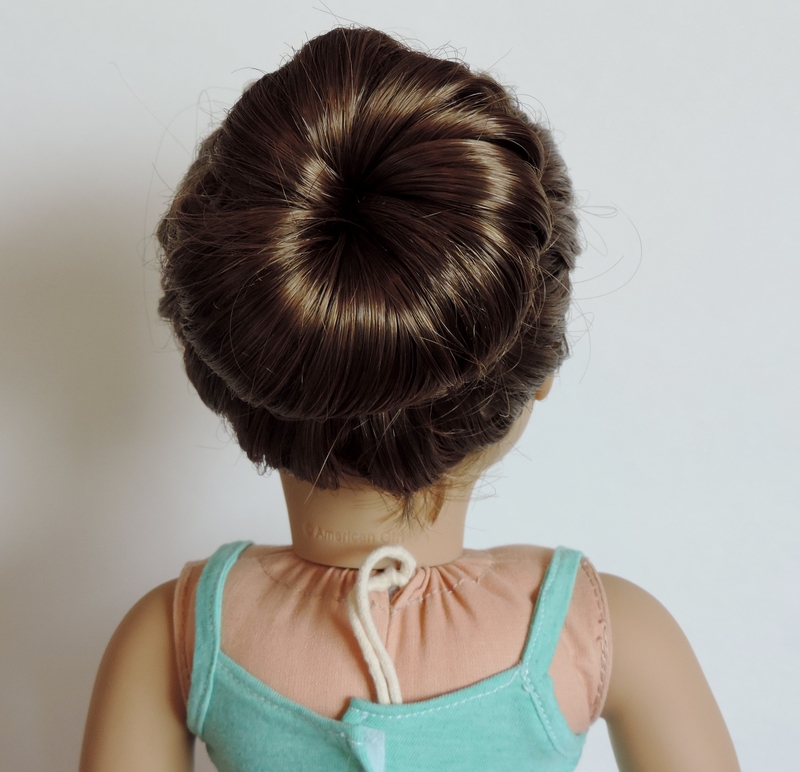 Put bobby pins in all the way around to keep the bun in place. You are done with the bun! 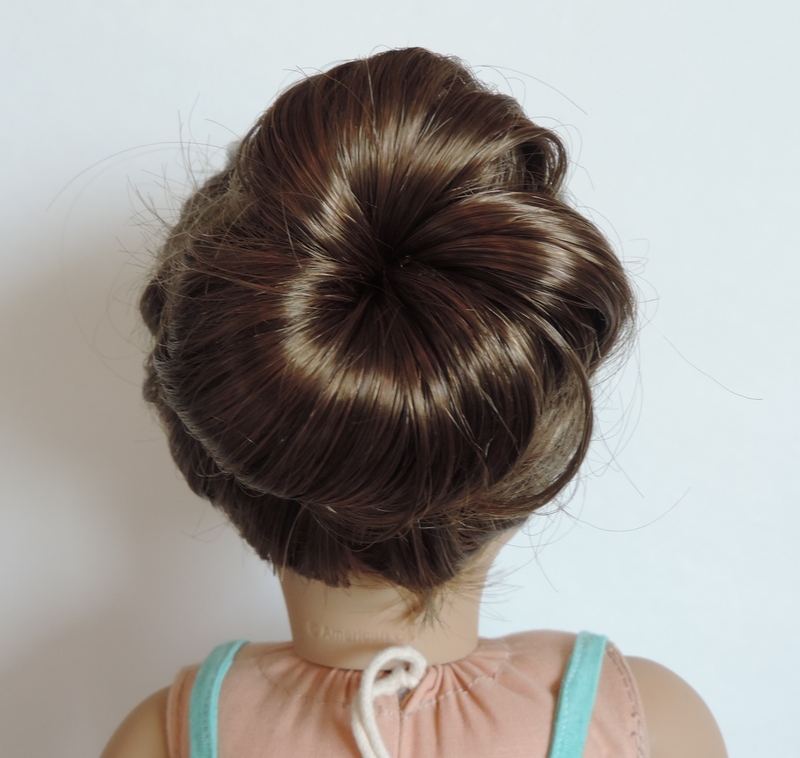 If your doll will be doing ballet, she may need a hairnet over the bun to make sure no hair starts to fly away. 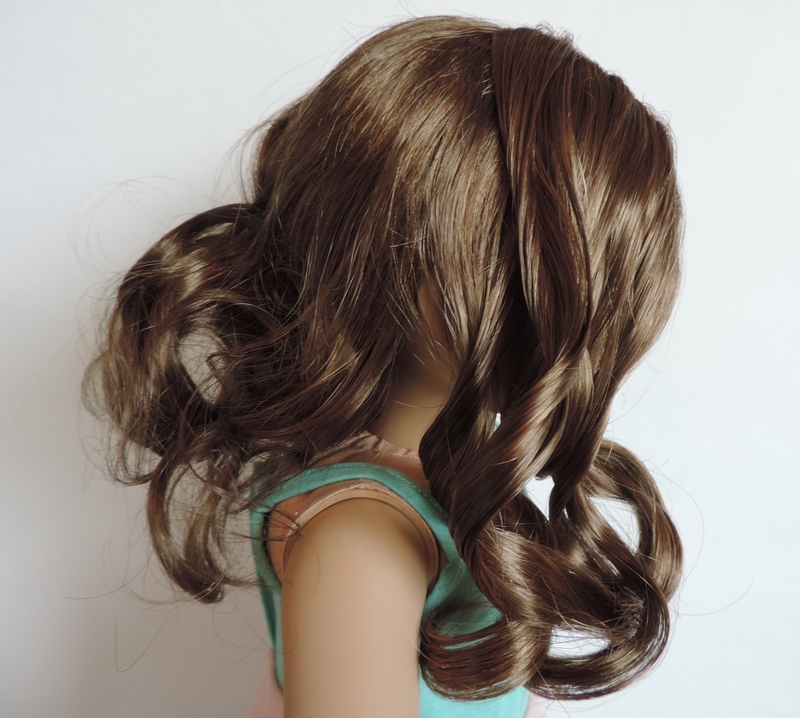 I used the hair net that my Rebecca arrived in. Put the hairnet over the bun. 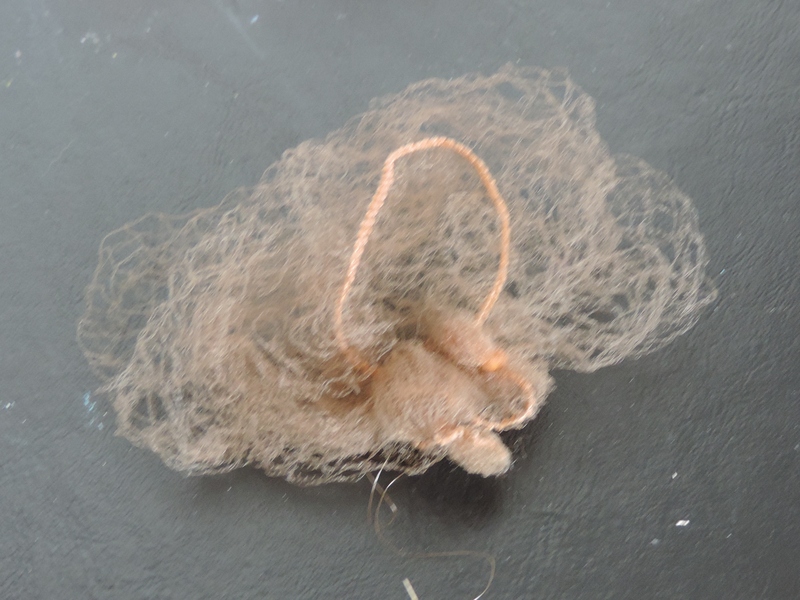 If there is excess, twist and put the net over again. 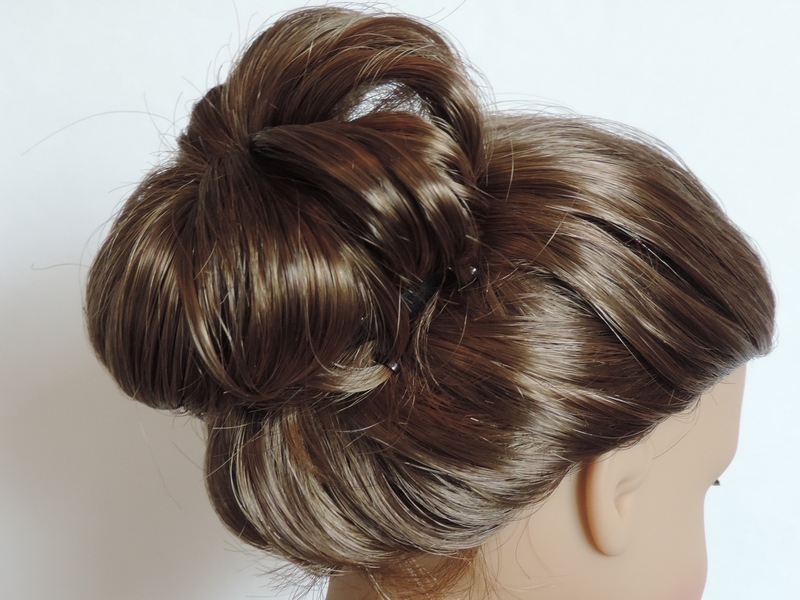 I didn’t have enough excess net to do this, so I just tucked the extra in underneath the hair of the bun. 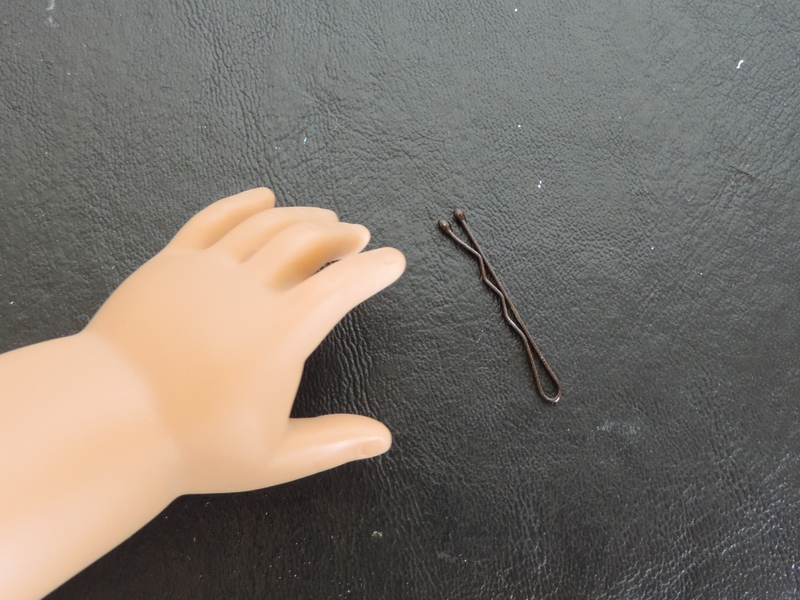 Secure the net with bobby pins. 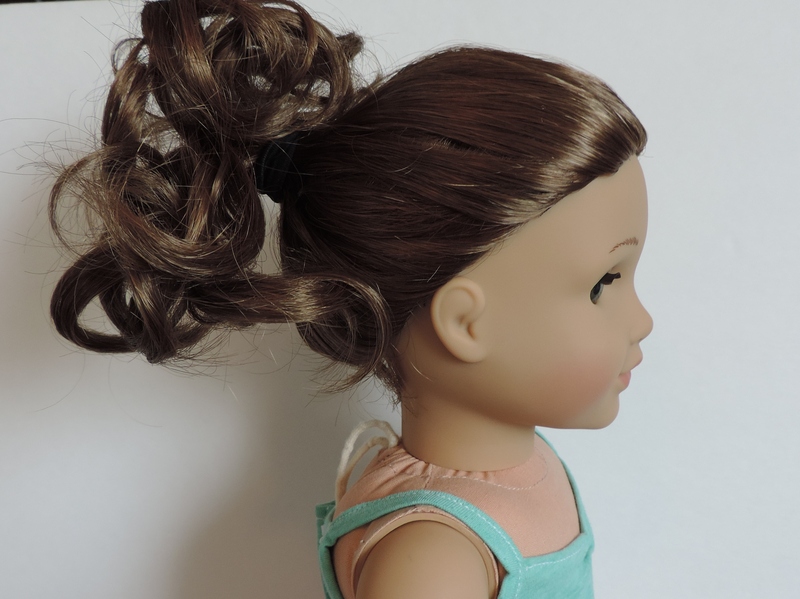 Front view: Now your doll won’t need to worry about her hair while she’s dancing!